Add images of your products so that your buyers can see what they are buying! It will enable them to browse, build and submit orders from your your Showroom (B2B/wholesale eCommerce) and retail eCommerce stores. From the Product Details tab of your product, click on the Images tab located on the top, horizontal main menu to switch your view. 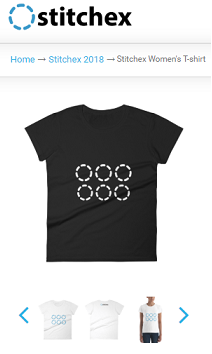 “Drag and Drop” your products' image(s) to the appropriate “Color” section (e.g. red, green blue, black, etc.). Or, click on the “+” sign to add photos as illustrated below. You can also "drag and drop" within the same section to control the sequence in which these are displayed in your Showroom. Colorways - These color sections are defined when the product is initial created in the "Colorways" field. See Creating a New Product for additional information. Size of Image - Your image must be square with a resolution of 1080x1080 to 2160x2160. Standard file formats work including jpeg, etc. Multiple Images - You may add as many images as you would like for one color. Example usage of multiple images: Front, back or side view of a particular product-color combination of a garment as illustrated above..
Cover Image - While you may have 30 images for one Product Image, there are some places within Stitchex that will only display one image. For those situations, you can specify which single image you want to use to represent your product by selecting "hoovering" your mouse over that image and clicking "Make Cover" as illustrated below. You will know making it a cover worked by looking at your Product Details tab. Also, click on the recycling bin on the right to remove the image from your color variation. If a Cover image is not identified, Stitchex takes the first image on the Product's Image tab to use as the cover in the Showroom. For more information on product display on Showrooms, please see our Knowledge Article. After arranging your products in the order you want them view, your buyers can scroll through these images in your Showroom by clicking on the right and left arrow buttons as shown below. See Swatch Image, Standard Colors for additional information. 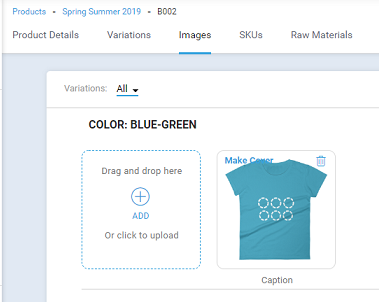 Once your Product Images, Swatch Colors/Image Colors are added, you can link them to your Showroom (B2B/wholesale eCommerce) and retail eCommerce stores.